Woof, friends. I had a major heart check this weekend. All because my brain was hinged on dollars, not moments. I mentally fought between good and best, honoring money-minded principles versus a real fear of hypocrisy. I’m human and I go over budget sometimes. And in this instance, I found myself at a crossroads of my money, friendships and sticking to my budget. I’ll tell you all about it. First, you should know that decision-making can be hard for me. Consider decision-making a “muscle,” and I’ve got the strength of a lousy rubber band. That muscle just ain’t all that strong. I take a little longer to come to conclusions. This whole scenario might not even be a *thought* for some people, but I struggle when things throw me off my normal path. So, here’s the situation. It’s nearing the end of the month, and I have $15 left in my “spending money” budget. It’s a Saturday, and I’m at the farmer’s market with two best friends, their husbands, a happy baby and $4 in my purse. It’s not very often that I get time with all of these friends. Lexi and her family live in Sioux Falls, so when they have a day to spend in Lincoln, it’s precious, wonderful time. Until it’s noon and the squad wants to eat out. And thus begins the standstill in my head. I had plans for the rest of my money already, and I didn't want to go over budget. This was a test for me. Is it worth going over budget to spend another couple of hours with everyone? Um, yes. Do I want to watch everyone eat while I sit by all hungry and frustrated with myself? I considered it. Do I want to be the one casting shame on my friends for wanting to eat out? Honestly, they still experienced my awful mental side-eye as I struggled to decide what to do. And I felt pretty stupid about it the whole time/all day. Ultimately, I was deciding between spending time with my friends and going over budget. I was down to $15 because I had bought all sorts of fun stuff already this month: a flight to San Diego for September, gifts for wedding season, clothes from a cute boutique, coffee with friends and plenty of healthy groceries. Just last week, I bought a ring at Target for $14. Boy, I wish I could have returned that ring and added some cushion back in my budget, so this scenario wasn’t so stressful. But I did buy that ring, and I can’t just return it the moment I want more money. What’s spent was spent. And that doesn’t help with the immediate situation. What’s a person to do?! Eventually I came to a conclusion. I decided that I’d rather go $20 over budget and spend time with my friends. It took me [kid you not] 30 minutes to decide — meanwhile sitting in the restaurant, staring at a menu and hoping my brain didn’t explode from my self-inflicted anxieties. And that’s embarrassing, even in front of my best friends. I don’t think money should rule our lives, but it certainly shouldn’t be ignored either. Sometimes we “have” and other times we “have not.” And I’m still torn on the principle of a personal finance coach going over budget ever, and you can judge me if you want, but I wanted to share my own internal struggle, so you know you’re not alone. You could say that this lesson will make future decisions easier: money and pride will probably not win over friendships and making memories. Sue me. Things would have looked differently if I was at home and friends I regularly hang out with wanted to go out to dinner — in that scenario, it’d be easier for me to say “no thanks,” stay home, save my money and perhaps catch up with them after dinner. Those impromptu situations happen a lot, so the weight of missing out is less. If we don’t live in an environment where it’s okay to admit — to ourselves or to others — that we don’t have the money to spend, then that’s an unhealthy façade and not helpful for vulnerability in friendships or for the health of our bank accounts. Good habits are still important, even if sometimes you fall short and disappoint yourself. It’s important to know how much money you have to spend and where it’s going. Don’t ignore that number. Know your income, your expenses and how much you can realistically spend on the fun stuff. When I go over budget, I roll over those expenses into the next month on my Mint account. I make up for that expense by spending less of my fun money the next month. It’s not ideal, and I wouldn’t suggest you allow this to happen often. If you’re going over budget regularly and significantly (like, more than $20, even), it’s time to reconsider your spending habits. 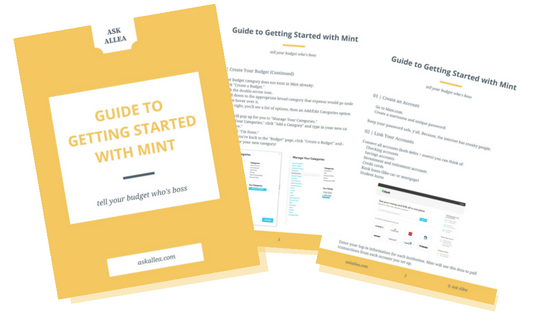 New to using Mint? Get my 6-step guide for getting started! Planning ahead and creating better habits. Keep $20-30 back each month, just for occasions like this. Don’t account for this in your weekly allowance or your monthly total for remaining spending money. Spend from last month’s rollover funds. This is actually my favorite part of budgeting. If you rollover $60 for clothes from July to August (this is easy to set up in Mint), it’s way easier to spend that $60 on a little shopping spree in August because you’ve already allocated it and have it set aside just for that purpose. It makes it way easier to spend money you actually earned last month than pulling it from future months that haven’t happened yet. What if you lose your job or get a pay cut? Don’t get in the habit of spending money you don’t have. No one is saying you have to be as hard on yourself as I am on myself. I hold myself to a higher standard, since people literally pay me to help them out with their finances and I’m 100% sure they expect me to live out what I advise — as they should! Give yourself grace, too. You’re doing good things.